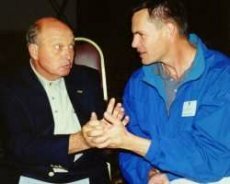 Since 1998 PGAProfessional.com has been a one-man operationPGA Professional Mark Blakemoreproviding a huge amount of golf instruction and golf-related information free of charge to enhance the learning process, development and enjoyment of golfers everywhere. I hope to continue to expand the site to be an increasingly valuable and comprehensive golf instruction resource. I welcome your feedback and suggestions toward realizing this ambition. Buy your golf merchandise from my Golf Pro Shop (where you will get not only the minimum advertised prices but also a 10% discount in the eShop portion of the Pro Shop for being a PGAProfessional.com visitoruse the coupon code PGAPRO10off at checkout). I do hope you continue to enjoy the site and please let me know if there is anything you would like to see that is not already here. Thank you for visiting. OK, this is where you can find out a bit more about me. You'll find a few forms of goofing around, I'll mention some of my interests and history in passing, and display a few odd photos. Perhaps somebody will find this entertaining. If not, thank goodness for links and free will. 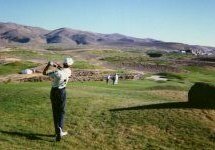 I'm Mark Blakemore, a PGA golf professional teaching at Boundary Oak Golf Course in Walnut Creek, California (in the east bay area of San Francisco). I work with golfers of all ages and ability levels. 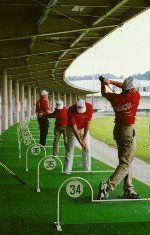 Private Golf Schools, Lessons and Golf Clinics or Outings for groups are available by appointment. If you can't come to work with me in person get my books, a 4-volume series of paperbacks covering the entire game in detail. I also have an "Ask the Pro" section, where you can check out questions golfers are asking and my replies to them, or ask a question of your own. 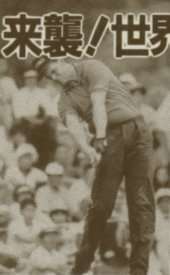 I was a charter member of the YONEX Long Drive Exhibition Team, from 1991-94. Here are a couple photos from our tour of Japan in 1993. We had some fun hitting 2-irons over a high fence 250 yards away in Nagasaki. Probably too much coffee; don't try this at home. I love teaching golf. Here are a couple "action" shots of M.B. Working with a student indoors at the San Mateo Golf Show. I used to play far more than I do now (man, do things take time, or what?!!). I think I recall actually being pretty good once upon a time, but I suppose that could be my imagination. I got this hat while playing in Hong Kong, thinking it would help me play like Hogan ... it didn't. 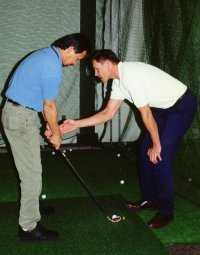 Even as a very young child I had an intuitive understanding of the forces involved in a golf swing. ...but MAN I was ugly, wasn't I? The only information I "collect" is your email address, if you sign up for the newsletter or enter it one of the forms on the site. If you submit a question to the Ask the Pro section and it gets posted your name and city, state, country etc. will be posted with your question and answer, but your email address will never be posted or shared for any reason.